This weekend, April 1st and 2nd, is the St. Joseph Women’s Guild annual Lenten retreat “Broken & Given” at the Clearwater Lodge. This is an all-inclusive retreat for $125-$185 per person based on lodging selection. It&apos;s not too late to register!! Call Alisa Kostecka at 710-7559 if you want to attend. We are nearing the end of the Lenten season. Join us for Stations of the Cross on Friday, April 7th followed by a simple Soup Supper provided by the Women&apos;s Guild. On Sunday, April 9th we will have the distribution of palms on Palm Sunday, which is the commemoration of Jesus&apos; triumphal entry into Jerusalem. The faithful of the Diocese of Spokane are invited to the Chrism Mass which will be celebrated at 5:15 PM on Tuesday, April 4th at the Cathedral of Our Lady of Lourdes. Bishop Daly will be joined by the priests of the diocese for this annual blessing of Holy Oils. The name of this Mass comes from the Sacred Chrism which is one of the oils to be blessed and then used for celebrations of Baptism, Confirmation, and Ordination to the Priesthood. The other oils to be blessed are the Oil of the Sick and the Oil of Catechumens. All are welcome and encouraged to attend. Divine Mercy Sunday is a very special Sunday based on the private revelations of St. Faustina Kowalska. It is to be celebrated on the Second Sunday of Easter, April 23rd this year. In her diary St. Faustina accounts how Jesus offers us the total forgiveness of all sins and punishment to any soul who goes to Confession and receives Him in Holy Communion on that day. Jesus further asked that the Feast of the Divine Mercy be preceded by a Novena which will begin on Good Friday, April 14th. Please join us for this Novena every day at 3:00 PM in the chapel. Then join us for Mass on Sunday, April 23rd. Mass will be celebrated by Fr. Tom Caswell. We are happy to announce that (as of today) St Joseph Parish has reached 99.5% of our goal of $63,769. To date, our parish members have pledged $63,450. Thank you for your generosity and for helping us to meet our obligation to the Bishop and the Diocese as a whole. Great job!! I write this note with both happiness and sadness. I recently accepted a job at Excelsior Youth Center as a full-time Executive Assistant starting April 17th. It has been a pleasure working for all of you the past 6 years. I will miss many things about this job, but mostly I will miss the great people who make up the St. Joseph Family. Please feel free to stop in the office in the next several weeks to say farewell to me. Start gathering items for the Youth Missionaries’ Garage Sale! The youth going to Guatemala in August have a yard in Camelot for their annual garage sale! This has the potential of raising thousands of dollars in a three-day span! They need items to sell. It is a good time for you to start SPRING CLEANING!! We will take all your sellable donations. There is a donation bucket in the Gathering Space for smaller items. If you have large items you would like to have picked up, please call LaRena Rondeau at 320-760-4074 to make arrangements. If you want the office to add your donated items to your tax deductible contributions please call Jeannie at 466-4991. She will be happy to send you a receipt. 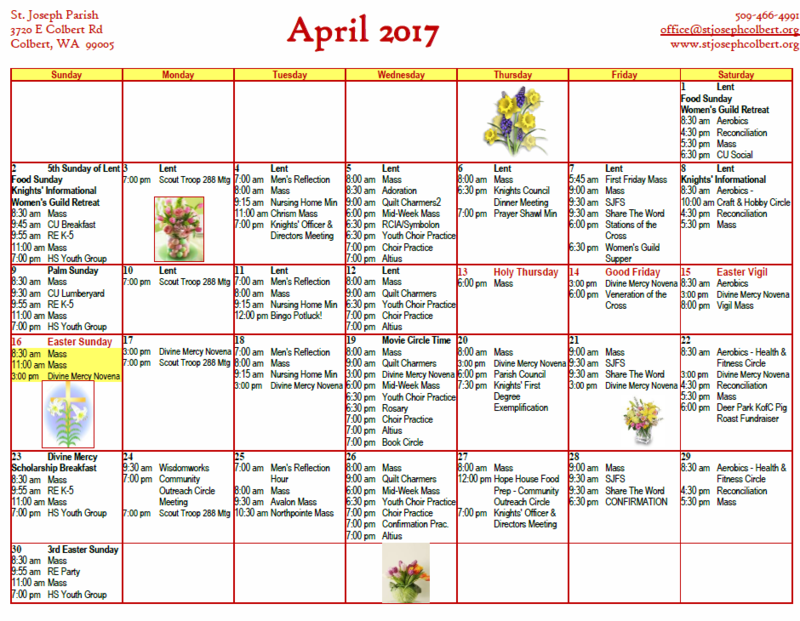 This weekend, April 1st and 2nd is a regular Food Sunday weekend. Please bring the items that you normally do. Palm Sunday, April 8th and 9th will be the final Lenten Food Sunday. Please bring potato chips, granola bars, and toilet paper. Thank you for your ongoing generosity to the clients of the North County Food Pantry. Ever Wanted to Join a Choir? This is your chance! Jef Lant has taken on the role of Music Director for the next few months. Jef would love to see St Joseph Parish put together a big choir. He wants you to know that you need not be a gifted singer to sing in a choir! Choir practice for youth is held each Wednesday at 6:30 PM. The regular choir will practice beginning at 7:00 PM. Check it out! The best time you can spend is with Jesus in the Blessed Sacrament! Come this Wednesday, April 5th, following the 8:00 AM Mass. If you are scheduled already, please honor your hour so the Blessed Sacrament is not exposed alone. If you need a substitute, please contact Patti Parra at 998-2364 or Chuck Meeks at 953-4976. After an extended break, the Men&apos;s Prayer and Reflection Group that meets on Tuesday mornings is back at it. If you are interested in joining them, they meet each Tuesday at 7:00 AM in the conference room next to the parish office. Join them! Bring a Potluck dish and your A-Game for an afternoon of fun! No age limit! They meet every second Tuesday of the month. This month&apos;s party will be on Tuesday, April 11th beginning at noon. Bring a friend!! Srs. Roberta Lamanna & Rosemary Thielman will be in our parish on Monday, April 24th for their final session of Wisdomworks for this season. Please watch the bulletin to learn the theme of this session. Mark your calendars NOW. Wisdomworks will begin at 9:30 AM and run until noon. Bring a friend! This is always a fun and informative way to spend a morning. Eucharistic ministry to the homebound is a vital way in which we continue to extend the love and concern of Christ, and our parish, for those who are unable to attend Sunday liturgies. If you or a loved one needs to have a home visit to receive Holy Communion, please email stjoseph@cet.com or call the parish office at 466-4991, to schedule a time. This outreach ministry includes weekly Catholic services at Avalon Nursing Home and Northpointe Assisted Living, as well as a Mass each month. If you are able to share in this ministry at a very special time in these people&apos;s lives, to extend God&apos;s loving care and compassion, please contact Pete at 238-6004 or Linda at 467-3406. Carpenters&apos; United New Lumber Yard! Is there more to life than busy-ness, suffering and making it until Friday? Pressure to perform at work, demands of people in your family or struggles with health or finances all leave you wondering what life is all about. You know there’s more to life, but maybe you just haven’t quite tapped into what the so-called “more” is yet. Here at the Carpenters United Lumber Yard, we want to address some of life&apos;s deepest questions along with you. You don’t have to have all the answers to make St. Joseph’s Parish your own, but we invite you to come and explore the Lumber Yard so you can pick out the choice materials to build your house on the ROCK and live abundantly in it. St. Joseph Parish welcomes you to the abundant life every Sunday at Mass and in-between. Make Sunday matter when you come for Mass and more! Religious Education classes for children in Grades K-5 are winding down. There will be no class on Easter Sunday, April 16th. The final class is scheduled for Sunday, April 30th. The children and their teachers will celebrate with a party!! On Friday, April 28th Bishop Thomas Daly will here to confer the sacrament of Confirmation on our second graders. The children will also be receiving their First Eucharist. Please keep these children and their teachers in prayer as they prepare for this momentous occasion. Note: There will be a rehearsal on Wednesday, April 26th following the 6:00 PM Mass. If you have a child receiving their sacraments, please plan to attend this rehearsal. The Prayer Shawl Ministry will only meet the FIRST Thursday of every month starting in March. This meeting time coincides with the Knights’ Council Dinner meeting. If you knit or crochet and would like to participate, please feel free to join the next meeting on Thursday, March 2nd at 7:00 PM. Call Connie Schmidt (509) 951-5623 for more information. For 6th –8th Graders: designed as a bridge from the RE K-5 program to the more diverse High School programs. Focusing on understanding the Mass and the sacraments, with a strong emphasis on hands-on projects.Join us!! High School Youth Group—Sundays at 7:00 PM. For 9th–12th Graders: focuses on evangelization and proclaiming the salvation in Jesus Christ and our response in faith. The Women’s Guild continues to be an active group. It is exciting to see how many women of the parish are finding ways to become involved. Movie Circle: - April 19: Movie and Time will be sent by email. If you would like to be on their email list please contact Farol at 464-0505. Hope House Meal Prep - Thursday, April 27 at 12:00 PM. Please watch the Women&apos;s Guild Facebook page and email for the shopping list. You can check out all the activities of the Women’s Guild, including pictures of past events on their Facebook page or on our parish website. For more information about the Knights of Columbus check out their web page on our parish website. please contact the parish office at 466-4991. Saturday at 4:30 PM or by appointment. Please call the office to schedule.